I showed you some of my recent beauty purchases for the Summer in part 1, and now it's time to show you what else I've been picking up! Honestly, most of these are repurchases that you've already seen before. I get extremely confused when bloggers constantly rave about products and how they are "favorites" or "must-haves" or even the oddest of beauty blogger terms, the "holy grail". But then you never see or hear about them again, until the newest exciting thing comes along to replace the old! I want to prove that some things really are worth buying over and over because they are just that good. 1. Soap & Glory Flake Away - perfect body polish for exfoliating rough arms, legs, and decollete. It also happens to smell divine. The grains aren't too rough, just enough to slough off dry patches. I get mine at Ulta, but a little goes a long way so you get your money's worth. 2. Real Techniques Miracle Complexion Sponge - I've been using sponges to apply my foundation for years now. I tried the beauty blender, but found that it was too stiff for my liking. These sponges by Real Techniques are soft and pliable so you can really maneuver around the planes of your face. I also like the shape of it. It covers plenty of area, but also has edges to get close to your eyes, and around your nose and mouth. I dampen it with some fix + by M.A.C. and then dot some of my favorite foundation over the places I need it most (cheeks and chin). It's also a fraction of the price of the beauty blender. Perfect! 3. Cetaphil Daily Facial Cleanser - I love this cleanser, and so does every single dermatologist I've ever spoken to. It's gentle enough for sensitive skin, but you also feel that you're getting a good deep clean minus harsh chemicals. I sometimes deviate to trying other cleansers, but I always end up coming back to this. 4. Lush Ro's Argan Body Conditioner - I really can't say enough about this product. It was love at first sniff, and then once I tried it in the shower, it was love at first touch! Or first shave! I use it liberally all over my body to add moisture while I'm in the shower. I then remove it by shaving! Yes, I shave the excess off and it acts as a cream. Two uses in one! If you love the scent of roses, then you must try this. 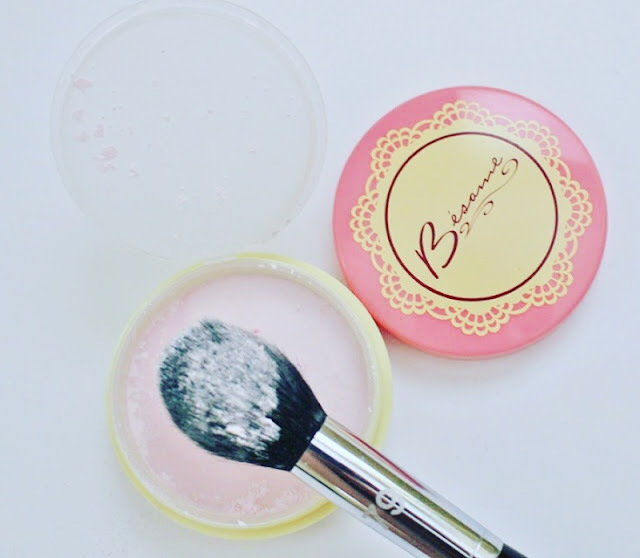 For a long time, I had been using Benefit cosmetics Powderflage. Remember that? It was a baby pink setting powder meant for the under eye area. I was literally devastated when they discontinued it. Not even being remotely dramatic either! Well a couple months back, maybe longer, I was in Sephora and on a whim I asked an SA if there was something similar. It took her a second to think, but she brought me this little pot of pure pink perfection and it's essentially the same color and consistency as powderflage. 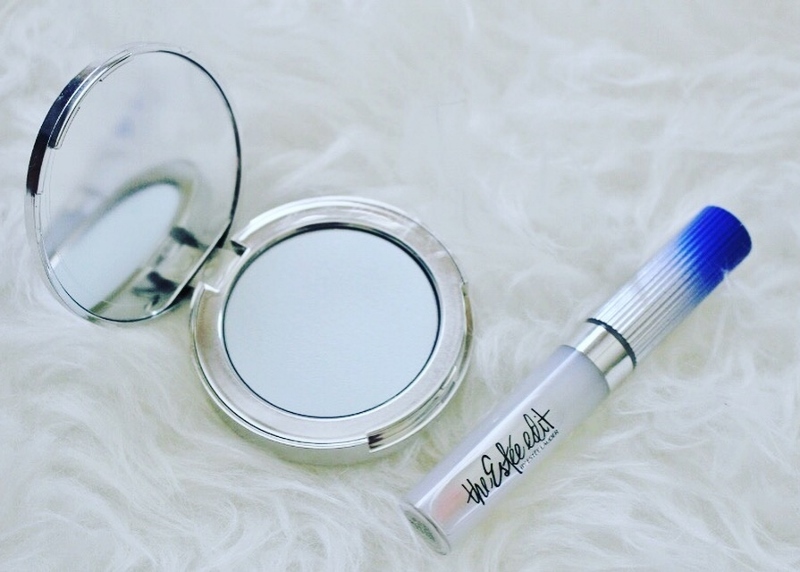 I use it to set my concealer and brighten up the inner corners of my eyes. I bought these two products around the end of April before my sister-in-law's Vegas celebration. I knew there would be a ton of photos taken, and I wanted to up my game in the flash photo department. More than anything, I was curious about the line. I have to say, I'm really impressed by the powder! I've been using it religiously on days where Nate takes my outfit photos, and I do think that my skin looks more radiant. The concept being that the light blue hue brightens up the skin for a soft focus glow that translates beautifully on camera. The gloss is also really nice! Non-sticky and easy to wear because it's clear. I tend to want to layer mine over a lipstick, but I think it's probably best to just wear it alone. It has blue pigmented pearls that make your teeth appear whiter and brighter in flash photography. With everyone so obsessed with selfies and filters, I think these are worth trying. Not must-haves in comparison to other products mentioned above, but still a cool concept to play around with! I need a break from sheet masks. I used up every last one I had, and then promptly freaked out because I like to do a mask one night per week. While making the daily rounds at Urban Outfitters in Oahu, I found this brand and in particular was drawn to this face mask. 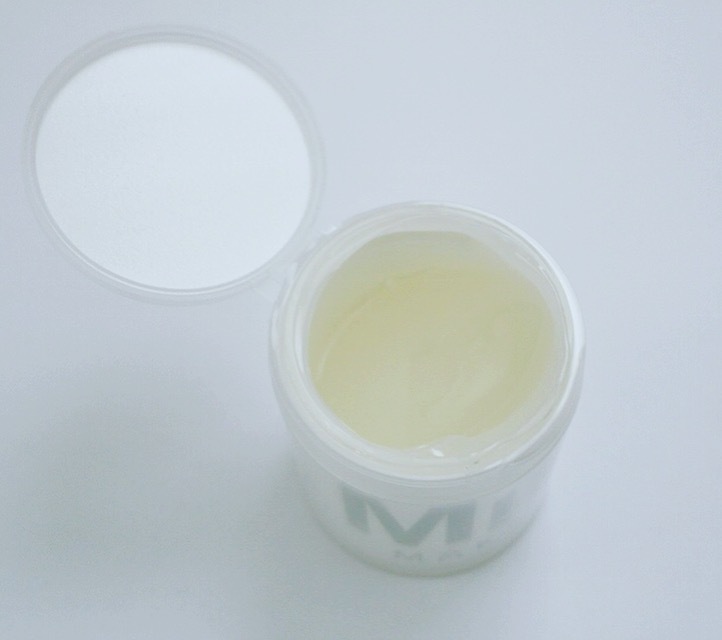 It has essential vitamins and jojoba oil, and it's the consistency of a gel. It feels so good while on the skin! I'm used to masks made from thick clay, so this is a nice change for the hot Summer months when I want something more refreshing. I've only used it a handful of times, but so far so good. I have a few more beauty posts planned in the coming weeks so stay tuned if you enjoy this side of my blog. Happy Wednesday! I swear by cetaphil too! Been using it for years and love that it's cheap too! I want to try the lush! I love the packaging of that Besame powder! That's so cute! The flash photo products sound interesting, and I also want to try the real techniques sponge! I have a beauty blender thing but I do think something more pliable could be good. Thanks for the reviews and recommendations! Definitely buy the pack of two Real Techniques sponges! They are wonderful and inexpensive too. I know you'll love them. I'm glad you like my beauty posts! They are fun to do! I want to try the flake away! Thank you for sharing this! No problem Tiffany! Let me know if you do! The lush conditioner sounds great! 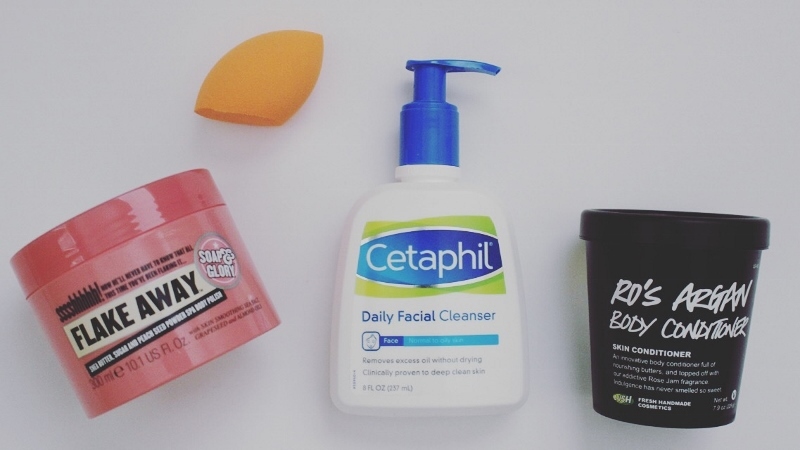 I love Cetaphil--just talked about them last week (and a giveaway). Used it for years. Flake away is another must-have for me, So good!